Dad's in the hospital so I stay home and take care of the critters while mom tends to dad. I was gone almost all day tuesday so the cats got revenge on me yesterday and sat on me all day I check on Maui on and off all day and get her outside to pee and such. Gonna need a heavier plastic bag for her cast today, ti's rainy-ish. She gets around fairly well for having a cast. Sorry about your dad, Neckipoo. What happened to Maui? 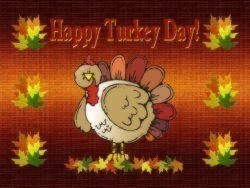 Happy Turkey Dayn to everyone! Maui broke her back leg somehow. Subject: Re: Happy Turkey Day!